For my next fabulous blog I’m sharing with you a tutorial on how to style this glamorous 1940’s inspired pinup hairstyle with curled hair, two victory roll and a poodle fringe. I would say this style is more of an intermediate style level but with a bit of practise anyone can definitely master this look. I do hope you enjoy today’s tutorial! My next blog will be up on Tuesday! 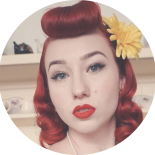 This entry was posted on November 24, 2018 by Miss Lady Lace in Pinup, tutorial, Videos, YouTube and tagged 1940's, 1950's, blogger, glamour, miss lady lace, miss lady laces pinup blog, perth, perth pinup, perth pinup blog, perth pinup community, pin up, pinup, pinup blog, pinup blogger, pinup fashion, pinup girl, pinup life, pinup lifestyle, pinup perth, red lips, retro blog, retro girl, retro glamour, the perth pinup community, victory rolls, vintage, vintage blog, vintage blogger, vintage fashion, vintage girl, vintage glamour, vintage perth, vintage pinup blog.